Can I install a FACE Module in Airtop2 myself? It is not recommended because taking out the FACE Module panel requires taking apart the whole computer. It is advised to order Airtop2 pre-installed with the FACE Module you intend to use. Is it possible to buy the case without a cpu and gpu (case only)? Airtop2 requires a custom motherboard. The GPU has to be reworked so it functions without a fan. Please note that Compulab offers upgrade kits for replacing the GPU. It is technically possible to assemble the CPU but while Airtop2 is very user-friendly when it comes to RAM and hard disks, installing a CPU is quite labor intensive because it requires taking out the motherboard. Intel’s Xeon E3-1275 v6 features Software Guard Extensions (Intel® SGX). Does Airtop2 BIOS support this capability? Yes, Airtop2 BIOS supports SGX. 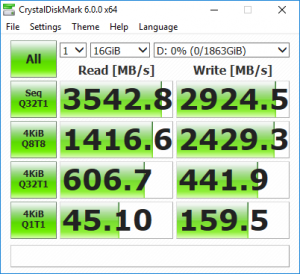 How fast are the read and write speeds when I install 4 x 2 TB SSDs? We did not measure everything in Airtop2, so I don’t have the exact number. The theoretical limit is 4×750 MB/s. In practice it will be limited by SSD performance and system overhead. BTW, if speed is critical you can get higher speed with 2x NVMe. That we did measure. Will Airtop2 be available through Amazon? The build-to-order is an important feature that cannot be supported by Amazon. We will monitor demand for that and may decide later to make some configurations available through Amazon. Is it planned to have also a 10GbE interface available for the Airtop2? We have customers who install 10 GbE PCIe card in Airtop/Airtop2 (instead of graphics card).